As advanced practice registered nurses (APRNs), nurse practitioners benefit from increased responsibility and higher salaries, as compared to registered nurses. They care for patients from birth through old age, diagnose illnesses, and treat a variety of medical conditions. With their specialized graduate training, nurse practitioners act as primary care providers in many states. Nurse practitioners also earn lucrative salaries; the Bureau of Labor Statistics (BLS) reports that nurse practitioners earn an average salary of over $100,000 a year, making it one of the highest-earning positions in the field. Additionally, the BLS projects that employment for APRNs will increase 31% through 2026, a rate much faster than all other occupations. Online nurse practitioner programs offer a flexible path for career advancement. Registered nurses looking for greater responsibility in their careers -- and increased earning potential -- can earn an online nurse practitioner master's degree in as little as one year. Nurses pursuing their degree online can also continue to work full time, and many programs allow students to complete clinical requirements at their current workplace or at a local medical facility. As demand for nurse practitioners increases, registered nurses can prepare for roles as neonatal nurse practitioners, family nurse practitioners, or another specialty within the field. What Can You Do with a Nurse Practitioner Degree? 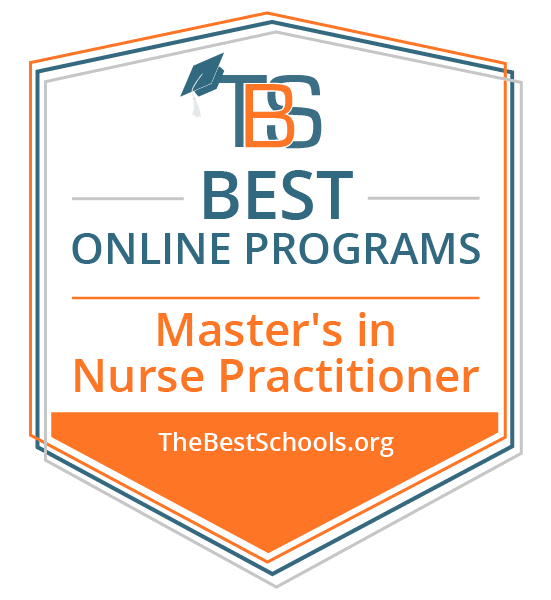 Online Nurse Practitioner Master's Degree Program Ranking Guidelines: We selected the degree programs based on the quality of program and range of courses provided, as well as school awards, rankings, and reputation. George Washington University ranks #1 on The 30 Best Online Nursing Practitioner Master's Programs! Chartered in 1891, George Washington University now stands as the largest institution of higher education in Washington DC. Students enrolled at GW hail from all 50 states and 130 countries, receiving instruction from a renowned faculty. The school is located within miles of the nation's most powerful institutions. With over 100 online programs, GW continues to find ways to grow and extend its considerable academic reach. GW Nursing offers five master's programs, all of which are delivered online. The school offers two nurse practitioner degrees: family nurse practitioner and adult-gerontology nurse practitioner. Students may enroll full-time or part-time, with the former taking two years to complete and the latter three. While most courses are asynchronous, there are some synchronous seminars. All nurse practitioner students must complete 700 clinical hours. Online students can complete clinical hours in their home communities, though GW must approve preceptor and site information prior to the start of clinicals or practicum rotations. The programs require two campus visits to DC: once during the year one health assessment course and again in the final semester. To apply to one of GW's online nurse practitioner programs, candidates must hold a BSN from a regionally accredited college/university and have a 3.0 GPA or better. Applicants must submit transcripts, two letters of recommendation, and an unencumbered nursing license. GW currently cannot accept online applicants from Alabama, Louisiana, or North Dakota. Clarkson College ranks #2 on The 30 Best Online Nursing Practitioner Master's Programs! Clarkson College began as a school of nursing in 1888, the first ever in Nebraska. The school has maintained accreditation by the Higher Learning Commission since 1984 and is authorized to offer online education in all states except Wisconsin and Massachusetts. Nearly 90% of the student population enrolls in at least one online course each semester. Clarkson College offers four MSN concentrations: healthcare administration, nursing education, adult-gerontology nurse practitioner, and family health nurse practitioner. Each program requires 39 to 47 credits. Students can complete the MSN in eight semesters. Upon completion of Clarkson's MSN program, graduates are eligible to sit for the American Academy of Nurse Practitioners National Certification Board (AANPCB) exam. Students must visit the Omaha, Nebraska, campus for certain clinical courses. The graduate symposium, held the Friday before graduation, is also mandatory for all online students. Prospective students must have a bachelor's degree in nursing from an accredited institution, an unencumbered RN license, and two years of professional RN work experience. No GRE is required. Clarkson accepts new students in fall, spring, and summer. Students have seven years from the date they are enrolled to finish the program. University of Cincinnati ranks #3 on The 30 Best Online Nursing Practitioner Master's Programs! The University of Cincinnati is the second largest institution of higher education in the state of Ohio and the oldest college in the city. Total enrollment at UC is nearly 45,000, with over 10,500 students at the graduate or professional level. UC nursing is recognized as an Apple Distinguished Program, a distinction given to schools that demonstrate innovation, leadership, and educational excellence. UC offers three online nurse practitioner programs: women's health nurse practitioner , family nurse practitioner, and adult-gerontology nurse practitioner. Full-time students can complete an accelerated program in two years. The curriculum covers topics such as biostatistics, healthcare policy, and pharmacological treatment in evidence-based practice. All programs culminate in a capstone experience. To apply to this post-licensure MSN, candidates must hold a BSN and submit three letters of reference, a personal goal statement, and professional resume. Out-of-state online nursing students pay only $15 more per credit than in-state students. UC's online master of science in nursing prepares graduates to sit for either the American Nurses Credentialing Center (ANCC) certification exam or the American Academy of Nurse Practitioners (AANP) exam. University of Cincinnati is regionally accredited by the Higher Learning Commission (HLC). Cedarville University ranks #4 on The 30 Best Online Nursing Practitioner Master's Programs! Established in 1887, Cedarville is an independent Baptist university offering more than 130 programs of study. Cedarville provides on-campus, blended, and online nursing degrees and certificates. Online classes are asynchronous so students can attend class whenever and wherever is most convenient for them. The online family nurse practitioner MSN requires 41 credits of nursing education and an additional three credits of graduate-level Bible study. Classes cover topics such as healthcare economics and policy, pathophysiology, and diagnostic reasoning. The FNP curriculum addresses the healthcare needs of adults, older adults, women, and children. Students learn how to assess, diagnose, manage, and treat common acute and chronic health problems for families. Every FNP student must attend two three-day on-campus experiences. Students who attend part-time can complete the master's program in seven semesters while full-time students typically finish in six semesters. FNP students must complete 600 hours of direct care clinical work. To be considered for admission, prospective students must have a professed faith in Jesus Christ, a BSN with a minimum 3.0 GPA, and an unrestricted license to practice as an RN in the U.S.
Cedarville University is regionally accredited by the Higher Learning Commission (HLC). Duquesne University ranks #5 on The 30 Best Online Nursing Practitioner Master's Programs! Duquesne has been serving the educational needs of Pittsburgh residents since 1878. Today, the Catholic college educates nearly 9,500 students. In 1937, Duquesne's School of Nursing created Pennsylvania's first BSN, and in 1997, it debuted the nation's first online nursing Ph.D. Two years later, Duquesne transitioned its master of science in nursing to an online format, further opening its academic doors to nursing students beyond the Pittsburgh area. The family nurse practitioner specialty, also known as "individual across the lifespan," prepares nurses for primary care roles serving patients of all ages, from children to aging adults. The curriculum features coursework in enhanced clinical judgment, patient advocacy, collaboration, and workplace sensitivity. Though courses in Duquesne's accredited online practitioner programs are primarily asynchronous,, there are occasional synchronous class meetings. Online MSN students must visit the Duquesne campus twice for assessments and simulations. Applicants with previously earned graduate nursing credits, for which they received a grade of "B" or better, may apply up to nine credits toward the MSN. Graduates are eligible to sit for the CRNP certification exam. New students may begin in the fall, spring, or summer. Duquesne University is regionally accredited by the Middle States Commission on Higher Education (MSCHE). Samford University ranks #6 on The 30 Best Online Nursing Practitioner Master's Programs! The online family nurse practitioner program at Samford University prepares nurses for careers as primary care providers. Led by certified NP faculty members experienced in clinical practice and teaching, this 69-credit program explores the skills needed to apply holistic, evidence-based care. Students learn how to diagnose health problems, both acute and chronic, and how to provide comprehensive healthcare to patients of all ages. In the first year, students learn about topics such as information systems and technology, theory and philosophy, biostatistics, and pharmacotherapeutics. In year two, the curriculum moves into clinical decision-making and primary care for specific groups like women and children. The final year includes coursework in population health and policy, emergency and urgent care, and service learning. The program culminates in a practicum. Full-time students can complete the degree in three years while part-time students will typically need an additional year. Samford maintains partnerships with 100 clinical sites throughout the country. By program's end, students complete a total of 1,140 clinical hours. Classes are asynchronous and there are three required visits to the main campus in Birmingham, Alabama. Admissions requirements include a BSN from an accredited program, a GPA of 3.0 of higher, unencumbered licensure as a registered nurse, and a video submission. Applicants must have completed undergraduate courses in nursing research and health assessment. Graduates are qualified to sit for the ANCC or AANPCB national certification exam. New students may begin the program in January or August. Samford University is regionally accredited by the Southern Association of Colleges and Schools (SACS). Seton Hall University ranks #7 on The 30 Best Online Nursing Practitioner Master's Programs! Founded in 1856, Seton Hall serves nearly 10,000 students, 4,300 of which are studying at the graduate level. Located in New Jersey, this Catholic university offers over 90 majors and 90 graduate programs. Seton Hall's College of Nursing promotes servant leadership and contemporary healthcare education. The master of science in nursing (MSN) is available in four specializations, including two nurse practitioner tracks: adult-gerontology and pediatric care. Comprised of 48 credits and 600-640 supervised clinical hours, the MSN typically takes three to four years to complete. Aspiring NPs learn the fundamentals of wellness promotion, illness prevention, and health and healthcare management. For the adult-gerontology track, students study how to work with elderly populations in acute and primary care settings. Nurses in the pediatric track study healthcare from birth to early adulthood. Both online nurse practitioner programs focus on designing and providing care based on evidence. Nurses learn how to conduct advanced health assessments and manage a patient's health based upon health histories, physical exams, and analysis. The ability to communicate diagnoses, therapeutic plans, and healthcare regimens is paramount. Prerequisites for the online nurse practitioner programs include statistics, nursing research, and an undergraduate physical assessment course, all of which should be covered by a BSN. To apply, prospective candidates must submit official transcripts, two reference letters, a personal statement, and a resume or CV. All nursing programs are accredited by the Commission on Collegiate Nursing Education (CCNE). Seton Hall University is regionally accredited by the Middle States Commission on Higher Education (MSCHE). Indiana Wesleyan University ranks #8 on The 30 Best Online Nursing Practitioner Master's Programs! Indiana Wesleyan University is a private, evangelical Christian university located in Marion, Indiana. The school offers an online MSN in psychiatric mental health for nurses who aspire to provide healthcare and support to patients with mental health conditions. Students in the online psychiatric nurse practitioner program learn how to care for diverse populations, administer treatment, and collaborate with healthcare teams. MSN students are admitted as part of a cohort, allowing for collaboration, mutual support, and peer consultation. Class sizes are capped to create an intimate, focused learning environment. Classes are asynchronous. The master's program requires students to complete 49 credits, with courses taken in a sequential order. There are three mandatory on-campus residencies, one in advanced health assessment and two intensives. The accelerated program is rigorous; students must accrue a minimum of 525 clinical and practicum hours before graduation. IWU has approved preceptors at clinical sites throughout Indiana, Kentucky, and Ohio, as well as areas of Illinois and Michigan. IWU is a member of the North Central Association of Colleges and Schools and is accredited by the Higher Learning Commission. To apply, students must have an undergraduate nursing degree and an active, unencumbered nursing license. Applicants should also have at least one year of professional practice, including 500 hours minimum of direct contact or care for patients. To assist with decisions, the Division of Graduate Nursing may request an interview or GRE scores. Winona State University ranks #9 on The 30 Best Online Nursing Practitioner Master's Programs! Founded in 1858, Winona State University is the oldest school in the Minnesota State Colleges and Universities System. The school operates three campuses, with the one in Rochester primarily serving transfer and graduate students. WSU offers three nurse practitioner options: psychiatric mental health, family, and adult-gerontology acute care. Students move through the two-year program as part of a cohort of 15 students. The curriculum covers scientific and ethical foundations, organizational and systems leadership, and evidence-based practice. In year two, students focus on clinical rotations. In total, the program requires 720 total clinical hours. A scholarly inquiry project caps the program in the final year. Practicum placement is arranged for all students and is considered on a regional basis. Candidates for the nurse practitioner online programs must hold a current nursing license and a bachelor's degree in nursing from a nationally accredited program. Potential students must have completed undergraduate coursework in physical assessment, as well as nursing research and statistics. Students should have an undergraduate GPA of 3.0. Applicants to the adult-gerontology acute care program must meet further admissions requirements, including one year of critical care experience, advanced cardiac life support certification, and an ECG interpretation course. Winona State's nursing programs are accredited by the Commission of Collegiate Nursing Education. Winona State University is regionally accredited by the Higher Learning Commission (HLC). Saint Joseph's College of Maine ranks #10 on The 30 Best Online Nursing Practitioner Master's Programs! Founded in 1912, Saint Joseph's College is Maine's only Catholic college. The school is accredited by the New England Association of Schools and Colleges and began offering distance education programs in 1976. SJC features three specializations for nursing professionals looking to earn their master's degree online: administration, education, and family nurse practitioner. The college also offers dual degrees (MSN/MHA, MSN/MBA) and an RN-to-MSN fast-track for RNs who have already completed 300-level nursing courses. The 48-credit online family nurse practitioner program blends instructional content with professional experience. Classes are taught asynchronously, allowing students to access lessons whenever and wherever is most convenient. Students learn as part of a cohort of 10 or 15, with sessions starting four times a year: January, May, August, November. Once matriculation begins, students have five years to finish all courses and clinicals. There are no required campus visits to Maine. Potential students must have taken statistics and a health assessment course in their undergraduate studies. Applicants must hold a BSN with a cumulative GPA of 3.0 or better. In addition, they must submit official transcripts, three references, and proof of an active, unrestricted RN license. The GRE is not required. Saint Joseph's College of Maine is regionally accredited by the New England Association of Schools and Colleges (NEASC-CIHE). Georgia College and State University ranks among The 30 Best Online Nursing Practitioner Master's Programs! Known as Georgia's public liberal arts university, Georgia College serves more than 6,600 students. In 2012, the Doctor of Nursing Practice became the university's first doctoral program. GCSU's MSN in nursing offers three tracks: family nurse practitioner, psychiatric mental health nurse practitioner, and nurse educator. Year one courses cover topics such as advanced nursing assessment, healthcare research, statistical analysis, and applied pharmacology. During the second half of the program, the focus shifts to lab work and clinicals that explore evidence-based care. By program's end, students will complete a minimum of 630 clinical hours. GC's accredited online nurse practitioner programs can be completed in two to three years, but students have up to seven years to complete the MSN. Classes blend synchronous and asynchronous elements, with students meeting at least once a week. For this program, all clinical rotations must be completed in Georgia with a preceptor approved by the School of Nursing. Students must visit GC's Milledgeville campus for a face-to-face immersion experience during their first summer. Five more trips are required for lectures and labs. Applicants must hold a nursing baccalaureate degree from an accredited program, provide evidence of licensure as an RN, and demonstrate ability to work in Georgia. All students must have earned a 2.75 GPA in the last 60 hours of their undergraduate degree. Georgia College and State University is regionally accredited by the Southern Association of Colleges and Schools (SACS). Upstate Medical University ranks among The 30 Best Online Nursing Practitioner Master's Programs! SUNY Upstate Medical University offers hybrid MSN degrees for students who want to combine the convenience of online coursework with face-to-face instruction. Distance learners near the Watertown area may complete a family nurse practitioner MSN or family psychiatric mental health nurse practitioner MSN. Students near the main campus in Syracuse may also complete a pediatric nurse practitioner MSN. The family nurse practitioner track consists of 50 credits, including a residency requirement of 36 credits. Core courses address the topics of health education, nursing theory, pharmacology, and leadership. All courses are sequential to ensure prerequisites and corequisites are met. The clinical courses begin with human anatomy and physiology and address how acute disorders manifest. Students move through the program as a cohort, with classes blending online coursework and weekly meetings. A thesis option is available, with participating students conducting independent research related to nursing. By the end of the online nurse practitioner programs, graduates may sit for certification. On average, it takes three years to complete the master's program. To apply, prospective candidates must hold a bachelor's degree in nursing and a 3.0 GPA or higher. In addition, they must have a current New York state RN license and CPR certification. No GRE is required. Applicants who hold an undergraduate degree may still apply as long as they have taken the following prerequisite courses: comprehensive health assessment, statistics, nursing management/leadership, nursing research, and community health nursing. SUNY Upstate Medical University is regionally accredited by the Middle States Commission on Higher Education (MSCHE). Wheeling Jesuit University ranks among The 30 Best Online Nursing Practitioner Master's Programs! Founded in 1954 in West Virginia, Wheeling Jesuit University is the newest of the 28 Jesuit colleges in the U.S. The small school serves 1,400 students from 37 states and more than 20 countries. The average class size rounds out at 14, with a student-to-faculty ratio of 11 to 1. WJU offers seven master's programs, including the master of science in nursing, which is available in three tracks: family nurse practitioner, nursing administration, and nursing education specialist. The accredited online family nurse practitioner program requires 51 credits of graduate study and 728 total clinical hours, which may be completed locally. The MSN-FNP culminates in practicum rotations. Students apply their skills and knowledge in advanced practice nursing for infants, children, adults, and aging adults. Upon completion of this online pathway, nursing students are prepared to sit for FNP national certification. To apply, candidates must hold a BSN, have an average GPA of 3.0, and submit three letters of recommendation and an essay. Transfer students to WJU's online nurse practitioner program may apply up to six graduate credits (two courses) in nursing so long as they earned a final grade of "B" or better. Wheeling Jesuit University is regionally accredited by the Higher Learning Commission (HLC). University of Central Missouri ranks among The 30 Best Online Nursing Practitioner Master's Programs! The online MSN-FNP program at the University of Central Missouri explores the clinical application of research for the diagnosis and treatment of illness. The 44-credit degree splits its curriculum between core courses and practicum. A capstone clinical experience completes the MSN, at which time graduates may sit for certification. Students pursuing the nurse practitioner program online take courses in graduate statistics, methods of research in nursing, nursing theory, and health appraisal. Communication is the cornerstone of this MSN-FNP program. Students gain the ability to effectively communicate with patients of all ages and backgrounds. Future FNPs must know how to apply reason and knowledge to assess, plan, intervene, and evaluate patient cases while providing attentive, skilled primary care. All distance learners must complete their clinicals in the state of Missouri or the greater Kansas City area. Part-time students can complete the MSN-FNP in three years' time. A full-time option is also available. To apply, prospective candidates must hold a bachelor's degree from a program accredited by the NLN (National League for Nursing) or CCNE (Commission on Collegiate Nursing Education). Potential students must also complete one year of post-baccalaureate nursing experience. Applicants should have a minimum 3.25 GPA. University of Central Missouri is regionally accredited by the Higher Learning Commission (HLC). The University of Texas Medical Branch ranks among The 30 Best Online Nursing Practitioner Master's Programs! The University of Texas Medical Branch opened its doors in 1891 as Texas's first medical school. In 1998, it became the first nursing school in the state to offer online graduate education. The master of science in nursing at UTMB is available in seven tracks. Four of these options are nurse practitioner tracks: family, adult-gerontology acute care, adult-gerontology primary care, and neonatal. Students learn how to integrate specialized knowledge, such as informatics, health policy, and financing, into the advanced practice of nursing. Students must also demonstrate leadership and use evidence-based practice while providing care. The family nurse practitioner concentration builds upon the broad discipline of community health, applying it to the family, its members, and their unique needs. The acute care concentration focuses on at-risk patients in an unstable state, while the primary care concentration focuses on preventative and general care. The neonatal track emphasizes care for babies and new mothers, including premature infants and at-risk newborns. The nurse practitioner online programs require 700 to 780 precepted clinical hours. Rotations are mainly fulfilled locally in the Galveston/Houston area. For students outside the H-GAC region, preceptor/site approval must be obtained from the UTMB School of Nursing. Part-time students can complete the online MSN in seven semesters. In addition to the two-day student orientation at the start of the program, distance learners must visit the Galveston campus five times, including once during each of the final four semesters for simulation testing. Applicants must submit proof of a nursing degree, transcripts, and one letter of reference. Potential students must also write a personal statement discussing work experience, personal strengths and weaknesses, and rationale for choosing the nursing profession. A minimum 3.0 GPA is required. Applicants do not have to take the GRE. Nurses who have already earned an MSN may apply up to 12 credit hours to the nurse practitioner program. The University of Texas Medical Branch is regionally accredited by the Southern Association of Colleges and Schools (SACS). Concordia University - Wisconsin ranks among The 30 Best Online Nursing Practitioner Master's Programs! Established in 1881 with just 13 students, this Lutheran university now serves more than 7,700 learners, with more than a quarter of its students seeking careers in the health professions. The nursing program available through Concordia University features a Christian-oriented curriculum led by faculty with practitioner experience. While approximately half of Concordia University's student body identify with the Lutheran faith, religious orientation does not influence admission to the university. The school's 41-credit online family practitioner nursing degree emphasizes the integration of liberal arts knowledge with advanced training in scientific concepts, making it one of the leading online nurse practitioner programs. Students enrolled in this program seek careers as nurse practitioners or nurse managers upon graduation. The curriculum provides foundational training in areas such as nursing theories, interdisciplinary collaboration, and research design. Students learn how to use health theories to guide their clinical decisions. An in-depth critique of current theories prepares students for ethical and evidence-based practice. The program familiarizes students with social and political issues that impact the nursing profession, including insurance and healthcare advocacy. Other core topics featured in the program include health assessment, healthcare informatics, and the relationship between genetics and diseases. Upon completing foundational coursework, students take advanced courses in diagnosing, pharmacotherapeutics, and clinical care of unique populations including pediatrics and women's health. This MSN program's global focus on health builds skills in cross-cultural communication so that nurse practitioners can deliver care that is congruent with the beliefs of patients. Regis University ranks among The 30 Best Online Nursing Practitioner Master's Programs! Located in the dynamic city of Denver, Colorado, Regis University offers more than 75 online degrees, including an online nurse practitioner program rooted in the teachings of Saint Ignatius of Loyola. One of only 28 Jesuit colleges in the U.S., the school gives students the opportunity to participate in a Catholic education that nourishes personal development in addition to service-oriented professional training. This 48-credit MSN family nurse practitioner program takes two years to complete and includes a distance education option for students in rural and underprivileged communities. Online students complete assignments synchronously and must be virtually present for one weekly session that lasts nine hours. Distance learners are required to attend five workshops at the Denver campus. Prior to beginning the program, students must complete an introductory statistics course. The curriculum begins with an overview of nursing theories and pathophysiology. Once students acquire knowledge in these areas, they develop skills in assessment, research, and primary care practice from a lifespan perspective. The program provides advanced training in healthcare for women and children along with education in ethics and healthcare policies. Fully accredited by the Commission on Collegiate Nursing Education, this program promotes professional advancement and adheres to rigorous academic standards. Students complete clinical rotations in a variety of healthcare settings including family and adult clinics. The completion of 630 hours of fieldwork is required to graduate, and online students may complete clinical requirements in their hometown. Upon graduation, students may sit for the nurse practitioner certification examination. Graceland University - Lamoni ranks among The 30 Best Online Nursing Practitioner Master's Programs! With its main campus just south of Des Moines, Graceland University provides Midwestern, out-of-state, and international students with access to one of the longest running online family nurse practitioner programs in the nation. With more than 25 years of experience in remote instructional delivery, this MSN degree combines expertise in distance education with a curriculum that emphasizes disease prevention across the human lifespan. The program consists of 23 credits of core courses and 24 speciality credits in family practitioner nursing or adult gerontology acute care. Online students have the option of enrolling full- or part-time. Participation in a two-day on-campus course is required. Through foundational training in areas such as nursing theory, diagnostic reasoning, and pathophysiology, students equip themselves with the knowledge needed to move into advanced roles working with children and adults in acute and primary care settings. Nurses learn how to attend to the physical, emotional, and spiritual needs of both pediatric and geriatric patients. Students pursuing the FNP specialization complete an advanced pediatrics course that explores common health issues of individuals from birth to adolescence. Adult and gerontology majors complete coursework that examines leading health problems faced by acute care providers, including disorders of cardiovascular and respiratory systems. This program offers three start dates. MSN applicants must have a bachelor's degree in nursing along with current RN licensure. Applicants must submit official transcripts with a minimum GPA of 3.0, three references, and a brief statement of goals. Students admitted to the program must pass a background check. Graceland University is regionally accredited by the Higher Learning Commission (HLC). Catholic University of America ranks among The 30 Best Online Nursing Practitioner Master's Programs! Nursing students have the opportunity to pursue their advanced degree from one of the leading Catholic nurse practitioner online programs. Located in Washington D.C., the Catholic University of America is the nation's sole institution of higher education established by U.S. bishops. This university has a long tradition of providing graduate education with its roots traced back to 1887. Today the university provides more than 6,000 students with an education that incorporates both Catholic philosophies and science, encouraging the integration of reason and faith. The university's family nurse practitioner program blends theoretical knowledge with practical training to prepare students for leadership roles in settings ranging from private practices to community clinics and hospitals. Rooted in contemporary best-practice models, the curriculum consists of core coursework in areas including population health, research, and assessment. Students learn how to utilize knowledge of pathophysiology and pharmacology to provide effective treatment. Familiarization with healthcare policies and diverse cultural needs allows graduates to sensitively and ethically administer care in managerial and clinical roles. Graduates of this program possess the expertise required to work with individuals of all ages. Students complete 700 hours of advanced field practice in numerous environments, allowing them to gain experience working with a variety of populations. Led by faculty with experience in areas such as maternity nursing, clinical pediatric research, and military nursing, students receive a well-rounded education. Students may enroll full-time or part-time. Full-time students can earn their degree in two years while part-time students complete the program in approximately three years. Catholic University of America is regionally accredited by the Middle States Commission of Higher Education (MSCHE). Midwestern State University ranks among The 30 Best Online Nursing Practitioner Master's Programs! Situated between Oklahoma City and Dallas-Fort Worth, Midwestern State University is the only university in the state of Texas to receive membership from the Council of Public Liberal Arts Colleges, an organization that promotes the value of a liberal arts education from a global perspective. The university cultivates academic excellence and creativity through research initiatives and innovative instruction. The school also provides learners with an affordable education, with more than 75% of its students receiving financial assistance each year. Students interested in online psychiatric nurse practitioner programs have the opportunity to complete their degree through Midwestern State University's distance education nursing program. This school's graduate nursing program currently offers two tracks: family nurse practitioner or psychiatric mental health nurse practitioner. Students complete 21 core credits with topics in pharmacotherapeutics, nurse practitioner leadership, and health assessment. Concentration courses for the family nurse practitioner track focus on diagnosis and treatment of illnesses from birth to old age. The psychiatric mental health concentration includes coursework in mental health diagnosis and developmentally appropriate treatment strategies. All students complete four practicum courses and nine hours of an evidence-based project. Each track admits students for the fall semester only. Applicants of either concentration must apply by April 1st to begin coursework in the fall. Eligibility requirements include a BSN degree from an accredited program with a GPA of 3.0 or better and active RN licensure for Texas or the student's state of residence. GRE scores are required as part of the admission process. Midwestern State University is regionally accredited by the Southern Association of Colleges and Schools Commission on Colleges (SACS). Indiana University-Purdue University-Indianapolis ranks among The 30 Best Online Nursing Practitioner Master's Programs! With its urban location and commitment to health sciences, Indiana University-Purdue University-Indianapolis fosters an academic environment that values community health and intellectual growth. One of the few online nurse practitioner programs offering five distance-accessible academic tracks, this MSN gives students both the theoretical knowledge and practical skills required to be a successful nurse practitioner. Concentrations include adult-gerontology clinical nurse specialist, psychiatric mental health nurse practitioner, leadership, and nurse education. The online curriculum consists of 16-week terms in the fall and spring and 12-week terms in the summer. Students complete 22 credits in core courses which are mostly delivered asynchronously; however, some classes require synchronous participation through videoconferencing. As part of the program's advanced training in physical assessment, learners attend five on-campus labs. Students complete 20-21 concentration courses in their area of interest. Distance learners are required to complete clinical hours in Indiana for all concentrations except for the nursing education track, which can be completed at the student's location. Candidates for this program must have a bachelor's degree from an accredited nursing program and unencumbered active RN licensure. The GRE is not required. Applicants must have a minimum undergraduate GPA of 3.0. The program accepts students for the fall semester. Students must complete an undergraduate course in statistics prior to beginning the program. Online students living outside of Indiana must pay out-of-state tuition, but those residing in certain midwestern states receive a tuition discount as part of the Midwest Exchange Program. Indiana University-Purdue University is regionally accredited by the Higher Learning Commission (HLC). Maryville University of Saint Louis ranks among The 30 Best Online Nursing Practitioner Master's Programs! Maryville University of Saint Louis currently serves more than online 3,600 graduate students. The university's online learning platform features an easy admissions processes, academic advising for individualized support, and one of the top nurse practitioner online programs in the nation. Distance learners in the school's online family nurse practitioner program complete their coursework entirely online with no on-campus visits. Students conveniently complete clinical hours within their resident community, and no GRE is required for admission. Four degree tracks allow students to select a program that fits their educational needs. The university offers a family nurse practitioner MSN for students with a bachelor's degree in nursing and RN licensure. Students without a BSN have the opportunity to earn their undergraduate degree in nursing while simultaneously pursuing their doctor of nursing practice in one plan of study. The school also offers a post-master's certificate for master's graduates who wish to specialize in family practitioner nursing. New students may begin at one of six start dates throughout the year. Composed of 15 courses, students in the family nurse practitioner MSN complete a combination of core classes, specialty courses, and 745 clinical hours. Students sharpen their leadership skills and acquire knowledge of healthcare management, program evaluation, and interdisciplinary collaboration. Topics in ethics, healthcare policies, and disease prevention prepare students for roles as community wellness advocates. This nursing program's advanced FNP training emphasizes a holistic model of health. Students engage in experiential learning sessions that integrate theories and practical applications for a variety of populations. The University of Texas at El Paso ranks among The 30 Best Online Nursing Practitioner Master's Programs! With an 80% Hispanic student body, the University of Texas at El Paso enrolls nearly 24,000 students. Designated as a Carnegie research institution with high activity, the university gives students the opportunity to participate in innovative research projects, including interdisciplinary health and Latino health disparities. The University of Texas features an expanding distance education program, including degrees in health sciences. Online students in the nurse practitioner program have the option of pursuing a concentration in family primary care, pediatric primary care, or adult/gerontological acute care. One of the top accredited online nurse practitioner programs, the MSN prepares graduates for national certification with the American Nurses Credentialing Center and the American Academy of Nurse Practitioners. Each concentration equips students with the skills needed to address contemporary health issues faced by society. In addition to familiarization with wellness models and common illnesses, students gain knowledge of acute and chronic diseases affecting the populations they wish to serve. The online curriculum relies on didactic teaching methods. Students may enroll part-time for the first three semesters of their program. While much of the program is completed online, students may be required to make three on-campus visits per semester. Students pursuing the acute care concentration spend two weeks in Houston or another city as part of their clinical fieldwork requirements. The University of Texas is regionally accredited by the Southern Association of Colleges and Schools Commission on Colleges (SACS). Northern Arizona University ranks among The 30 Best Online Nursing Practitioner Master's Programs! Centrally located in Flagstaff, Arizona, Northern Arizona University has served as one of Arizona's premier public research universities for nearly 120 years. Established in 1899 as a teacher training school, Northern Arizona University began its tradition of enriching lives through higher education with just 23 students. Today the university continues to promote student success through its accessible learning platforms. The school currently enrolls approximately 30,000 students annually. The university's online family nurse practitioner program emphasizes healthcare delivery for rural and disadvantaged populations. The family nurse practitioner track is a 48-credit program that encourages the development of communication, critical thinking, and leadership skills. Students learn how to provide clinical services to individuals and families from diverse backgrounds while adhering to professional ethics. This patient-focused FNP program emphasizes social justice and sustainable practices to promote global access to health. Students complete courses in areas such as applied pathophysiology, pharmacology, and theories of family nursing. In addition to online courses, students engage in fieldwork training that includes three practicum courses. Students may be required to complete clinical hours at an Arizona facility. Prior to beginning the program, students must complete undergraduate courses in statistics, nursing research, and public health nursing. Eligible applicants must have a bachelor's degree in nursing or an associate degree in nursing with a bachelor's degree in another area. Applicants should have a minimum GPA of 3.0 in nursing courses. Northern Arizona University is regionally accredited by the Higher Learning Commission (HLC). MCPHS University ranks among The 30 Best Online Nursing Practitioner Master's Programs! Offered through a university that specializes entirely in healthcare education, this online family nurse practitioner program allows students to graduate in 24 months at a part-time pace. Through MCPHS University's cutting edge online learning system, students gain meaningful experiences in the virtual classroom and clinical settings. Distance learners make three brief on-campus visits throughout the program. Prior to beginning coursework, online students attend an orientation that allows them to meet their peers and instructors. Students complete their first residency at the beginning of their second year and a final residency prior to graduation. The 42-credit program begins in the summer with courses in advanced pathophysiology and professional development. Students complete two classes each fall and spring and one class in the second summer. Courses cover topics in health assessment and family primary care for children, adults, and geriatrics. Learners complete a total of 630 clinical hours and a final practicum that focuses on the integration of scholarly knowledge with clinical practice. Admission requirements for this program include a bachelor's degree in nursing earned from an accredited school, a GPA of 3.0 or better in nursing courses, and current nursing licensure in the state where students plan to complete clinical hours. Applicants must have at least a year of full-time work experience as an RN. Massachusetts College of Pharmacy and Health Sciences University is regionally accredited by the New England Association of Schools and Colleges (NEASC-CIHE). Frontier Nursing University ranks among The 30 Best Online Nursing Practitioner Master's Programs! Frontier Nursing University was founded in 1939 to bring women in rural areas closer to contemporary medical care. Today the university offers several advanced training programs for aspiring nurses and midwives in one of the largest academic settings in the U.S. Not only does Frontier Nursing University feature the longest running midwifery program in the nation, it was also the first school in the country to provide a family nurse practitioner program. Catering to online learners, this 61-credit program is completed full or part-time in the student's community. Students take didactic courses that focus on core knowledge, clinical management, and specialty care. Nursing students earn 15 clinical credits by working with family nurse practitioners in their home community. Field experience may be completed at four different facilities over the course of 16 weeks for a total of 675 clinical hours. Clinical requirements encompass tasks such as conducting five newborn exams and 15 pediatric wellness exams for children ages 6-12. RNs considering the online nurse practitioner program must have a year of professional experience prior to applying. Preference is given to students with a bachelor's degree in nursing. Students who earned a bachelor's degree in another field and have an associate degree or diploma in nursing may be admitted to the program upon review of work experience. A minimum undergraduate GPA of 3.0 is required for admission to the program, and students must complete prerequisite courses in statistics and physical assessment. Frontier Nursing University is regionally accredited by the Southern Association of Colleges and Schools Commission on Colleges (SACS). Samuel Merritt University ranks among The 30 Best Online Nursing Practitioner Master's Programs! Since its opening more than 100 years ago, Samuel Merritt University has become a premier institution of higher education for nurses in the San Francisco Bay Area. The university's online family nurse practitioner MSN focuses on improving family health through promoting a healthy lifestyle, educating patients about common illnesses, and helping families with disease prevention. Graduates of the FNP program pursue careers in hospitals, clinics, private practices, and schools. Theoretical knowledge of nursing practice is augmented with practical skills training in areas such as pharmacology, family centered nursing, and treatment of acute and chronic conditions. Driven by evidence-based practices, the program teaches students how to thoroughly assess patients, conduct scholarly research, and develop intervention strategies. Students complete a clinical practicum and thesis or final project toward the end of their program. The 49-credit online curriculum takes less than two years to complete and students have the option of starting the program in the fall, spring, or summer semesters. Applicants should have a BSN degree and active RN licensure. The school also considers registered nurses with an undergraduate degree unrelated to nursing. Bilingual students with career aspirations that align with social advocacy and disadvantaged populations receive preference. Eligibility is limited by state authorization, and students residing outside of select states do not qualify for this program. Samuel Merritt University is regionally accredited by the WASC Senior College and University Commission. Briar Cliff University ranks among The 30 Best Online Nursing Practitioner Master's Programs! Named for the briar patches that once engulfed the fields of Sioux City, Iowa, Briar Cliff University traces its beginnings back to the progressive ideals of Catholic visionaries. The school's mission is to provide a Catholic Franciscan education that prioritizes student achievement. Briar Cliff University's online learning environment provides flexible and accessible educational options to students who would have difficulty completing an on-campus program. Briar Cliff University's nurse practitioner program is accredited by the Commission on Collegiate Nursing Education. The university's online MSN features concentrations in family nurse or adult/gerontology nurse practice. Consisting of 51 credits, the online FNP program takes three years to complete. Students engage in online learning for the majority of the curriculum, and clinical hours are completed at the student's location. The program provides training in health assessments, diagnostic and treatment procedures, and follow-up care. The 49-credit adult/gerontology track focuses on the healthcare needs of elderly patients. Students learn how to screen for health risks, diagnose diseases, and administer preventative care. Students in both tracks must complete a minimum of 540 clinical hours. Students interested in this program must be registered nurses with active licensure. Applicants should have a bachelor's degree in nursing from an accredited nursing education program. Other requirements include at least 2,000 hours of professional nursing experience and basic cardiac life support certification. Briar Cliff University is regionally accredited by the Higher Learning Commission (HLC). Texas A&M University–Corpus Christi ranks among The 30 Best Online Nursing Practitioner Master's Programs! Known for its unique island location, Texas A&M–Corpus Christi encourages social responsibility and the unwavering pursuit of knowledge. Students taking courses through Island Online receive an online orientation, instructional workshops, and individual attention from instructors. Courses are delivered asynchronously through the Blackboard learning platform. One of the leading online family nurse practitioner programs in the Gulf Coast region, the MSN features a 49-credit curriculum that includes coursework in nursing science and research, healthcare delivery in diverse settings, and assessment and diagnosis. Students receive advanced training in pharmacology and pathophysiology. This part-time program uses a cohort model. Students complete coursework and clinical hours over the span of three years. Field experience requirements include the completion of 630 clinical hours. Students must submit applications by April 15th to be considered for admission in the fall term. Transfer students may apply a maximum of 12 graduate credits toward their degree as long as they earned a “B” or higher. Transfer credits must have been earned from an accredited school within seven years prior to beginning the program. In addition to providing standard application documents, students must pass a background check and undergo drug screening. Students need professional liability insurance throughout the program. Cost of coverage is included in the program fees. Texas A&M University is regionally accredited by the Southern Association of Colleges and Schools Commission on Colleges (SACS). Angelo State University ranks among The 30 Best Online Nursing Practitioner Master's Programs! Founded in 1928, Angelo State University is part of the Texas Tech University System. The university continues to expand its reach through the ongoing establishment of distance education programs, including the online family nurse practitioner master's degree. This program features one of the highest pass rates for FNP certification among nurse practitioner programs, with 100% of its students earning their certification upon graduation. The 49-credit curriculum includes 27 credits of core courses and 22 credits specific to family nursing. Foundational courses introduce students to advanced nursing topics such as pharmacotherapeutics, pathophysiology, and informatics and healthcare technology. Other key areas covered in the program include health policy, ethics, and research methods. Students complete 650 clinical hours at a family primary care facility within the state of Texas. Out-of-state students may complete coursework online but are required to travel to Texas to complete practicum requirements. Eligibility for this program is limited to U.S. citizens with a BSN from an accredited nursing program. Applicants must have a minimum undergraduate GPA of 3.0 and unencumbered Texas RN licensure. All applicants must complete a prerequisite course in statistics. Admitted students are eligible for the university's graduate scholarship program based on undergraduate performance. Qualifying students automatically receive awards without applying for the scholarship. Angelo State University is regionally accredited by the Southern Association of Colleges and Schools Commission on Colleges (SACS). Nurse practitioners act as advanced practice nurses, and in many states, provide primary care without a physician's supervision. They conduct physical assessments, diagnose medical conditions, and -- depending on the state -- prescribe medication for their patients. Within the field, nurse practitioners usually specialize in areas like pediatrics, family practice, or mental health. They work with patients of all ages, from newborns to elderly patients who need palliative care. During an online nurse practitioner program, students train in advanced health assessment, evidence-based practice, and primary care. They also complete courses in their specialization, which can include coursework on common medical conditions affecting premature newborns or psychiatric healthcare, depending on the concentration. Online programs also incorporate clinical hours to build practical experience during the master's degree. Nurse practitioners must hold a master's degree to earn state licensure and qualify for board certification, but only accredited online nurse practitioner programs meet the licensure and certification requirements. Earning a master's degree from a nurse practitioner program prepares graduates for a lucrative and rewarding healthcare career. In addition to nurse practitioner programs, registered nurses pursue many other graduate-level degrees to advance their careers. Nurses who want a master's degree can also consider programs in healthcare administration, nursing administration, healthcare management, or healthcare informatics. These degrees prepare nurses for leadership roles throughout the healthcare industry. Attending an online nurse practitioner program helps registered nurses advance their careers with a flexible, accessible format. During an online program, nursing students use a virtual classroom experience, discussion groups, and other online learning technologies to complete their coursework. They also take exams online and gain medical experience through physical assessment simulations. Depending on the program, students may either meet for classes at a set time, or complete coursework at their own pace and according to their own schedule. Regardless of the format, however, online programs offer greater flexibility than most on-campus programs. Since online students can arrange their coursework around work responsibilities, they are especially attractive to nursing professionals who intend to continue their career while they earn a degree. Students in an online nurse practitioner program also gain valuable clinical experience as part of their training. Most programs incorporate a minimum number of clinical hours, which students often arrange in their local area. Online nurse practitioner students may also complete on-campus residencies during their degree to test their clinical skills. An online learning format may also appeal to nurses looking to specialize in a high demand concentration that local universities may not offer, such as neonatal nurse practitioner or psychiatric mental health nurse practitioner. Despite the flexibility and opportunities that online learning offers, prospective students should note that an online degree requires nurses to be highly self-motivated and disciplined. Students pursuing nurse practitioner programs online must already be working as registered nurses. This advanced degree prepares nurses for careers with greater patient responsibilities and leadership demands. The most successful graduates demonstrate a dedication to individual patient needs, attention to detail, and strong decision-making and communication skills. Nurse Practitioner: Nurse practitioners are advanced practice nurses who act as primary care providers for patients. They diagnose conditions, create treatment plans, and prescribe medication. Family Nurse Practitioner: Family nurse practitioners provide primary care for patients of all ages, including treating and diagnosing diseases. They prescribe medication, monitor medical conditions, and perform wellness exams. Psychiatric Mental Health Nurse Practitioner: Psychiatric mental health nurse practitioners treat patients with mental health disorders, including anxiety and mood disorders. They evaluate patients, prescribe medication, and work with patients to manage mental health problems. Pediatrics Nurse Practitioner: Pediatrics nurse practitioners act as primary care providers for children from birth through adolescence. They provide wellness exams, diagnose medical conditions, and create treatment plans for their patients. Neonatal Nurse Practitioner: Neonatal nurse practitioners care for newborns who require medical attention. They often work in a neonatal intensive care unit (NICU), treating premature infants and newborns with illnesses or medical conditions. Neonatal nurse practitioners coordinate with a medical team to provide high quality care. Nurses enrolling in advanced practice nursing graduate programs benefit from more online options than ever before. However, prospective students need to choose the right online nurse practitioner program for their career goals and interests. Researching factors such as concentrations, cost, and program length can help nurses find the best online nurse practitioner programs. For instance, in-state programs usually offer the most affordable option, but some may not offer certain concentrations. Prospective students can research the best online colleges by state to identify top programs and narrow their list of prospective schools. Program Cost: Many students start by researching a program's cost. Nurse practitioner programs often list the cost per credit, so prospective students can determine the total cost for their degree. In addition to tuition costs, students should check for other associated expenses, such as technology fees, online student fees, and books. Transfer Policies: Nurses with some graduate credits can save time and money on their nurse practitioner program by transferring previous college credits. However, not all programs accept transfer credits, so research transfer policies and work with a transfer adviser to make the most of your previous credits. Note that most programs only accept credits earned from an accredited nursing master's program. School Size and Type: Large public institutions and small private schools both offer online programs for nurse practitioners. Some students may prefer a larger class size with more nurses in their cohort. Others prefer a smaller program with a lower student-to-faculty ratio. Prospective students should also consider specialized nursing institutions that only grant healthcare degrees. Program Length: The length of a nurse practitioner program can vary from one year to four or more years, depending on the program and the incoming student's prior degree. Some programs accept nurses without a nursing bachelor's degree, while others require it. Prospective students can also research full-time versus part-time options, depending on their preferred schedule. On-Campus Requirements: Many online programs include on-campus residencies, often to measure a nursing student's clinical abilities. Be certain to check for on-campus requirements, as an in-state online program with on-campus requirements may be more suitable than a program with four required residencies in another state. Thesis, Fellowship, and Work Requirements: Prospective students should research the clinical hour requirement for any nurse practitioner program. Some require nurse practitioner students to complete 600 clinical hours, while others require more than 1,000 hours. Prospective students can also research possible local sites to complete their clinical hours. Prospective students should prioritize accredited online nurse practitioner programs, especially those that hold regional or national accreditation. An accredited college or university has undergone a regular, systematic review of its student learning outcomes, graduation requirements, and faculty qualifications. Both the Department of Education and the Council for Higher Education Accreditation maintain current lists of accredited institutions. Some schools may also hold program-specific accreditation from leading organizations in the field. For example, nursing programs that follow the best practices for educating nurse practitioners are usually accredited by the Accreditation Commission for Education in Nursing (ACEN) or the Commission on Collegiate Nursing Education (CCNE). Nurse practitioners must attend an accredited program to earn their license, qualify for board certification, and receive federal financial assistance. Similarly, many employers only hire nurses with accredited degrees. Prospective students should check for ACEN or CCNE accreditation when researching potential nurse practitioner master's programs. How Long Does It Take to Complete an Online Nurse Practitioner Program? Earning a master's degree from a nurse practitioner program typically takes two to three years for full-time students. Incoming students without a bachelor's degree in nursing may take an additional one or two years of coursework before beginning graduate-level classes. While many programs expect students to work while enrolled in their nurse practitioner degree, schools may offer part-time schedules for students who prefer additional flexibility. Prospective students seeking an accelerated option can also research one year online nurse practitioner programs. In these programs, students complete coursework at a faster pace and earn their nurse practitioner master's degree as quickly as possible. Students can also earn their degree faster by applying transfer credits toward their master's degree. In addition to coursework, nurse practitioner students must complete clinical hours. The number of hours vary between program, but most require students to complete 600-700 hours. Before applying to online nurse practitioner programs, prospective students should research the average length of the program to ensure if fits their professional goals and timeline. Within online nurse practitioner programs, students often choose a concentration to specialize their degree. Concentrations such as family nurse practitioner, neonatal nurse practitioner, or psychiatric mental health nurse practitioner prepare advanced practice nurses for a specific career path after graduation. Nursing students must also complete clinical hours in the concentration area. One of the most popular nurse practitioner concentrations, family nurse practitioners provide primary care for families. Coursework in pediatrics and adult care focuses on health maintenance, preventative care, and acute care. Family nurse practitioners commonly work in a family practice and may also work independently, depending on the state. A neonatal nurse practitioner concentration prepares students to care for newborn babies, often in a NICU. Nursing students learn common medical conditions, illnesses, and challenges that affect premature newborns, including low birth weight and heart abnormalities. They also study conditions that require a NICU stay after birth. The psychiatric mental health nurse practitioner concentration trains students to assess a patient's mental health needs. Coursework focuses on the diagnosis and treatment of psychiatric disorders, including the use of medication or psychotherapy. Psychiatric mental health nurse practitioners can also train to work with groups or communities. Pediatric nurse practitioners work with children from birth through young adulthood. Their training covers health assessment for young patients, well-child exams, and developmental screenings. Coursework also covers treating acute illnesses, disease prevention, health promotion, and educating families on health and wellness. An adult-gerontology nurse practitioner concentration prepares learners to care for patients from young adulthood through old age. Students complete coursework on health assessment for adult and elderly patients, common illnesses and diseases, and palliative care. Adult-gerontology nurse practitioner students may also gain specialized training in a subfield like diabetes care, HIV/AIDS, or cancer. The specific courses required to complete a nurse practitioner online program varies by program and specialization. For instance, the curriculum for a pediatric nurse practitioner program differs from the courses required for a concentration in women's health. However, most programs offer similar courses in anatomy, approach to care, and medication, as outlined by the sample courses below. This course prepares students to assess adult patients and diagnose common health conditions and diseases. Students learn about medications and treatments, and develop critical thinking skills. This advanced course combines the study of genetics, physiology, and pathology. Students learn about the body's various organs and systems, how disease affects them, and how to manage symptoms. To prescribe medications, nurse practitioners must understand the risks and benefits of each drug. This course explores the role of prescription drugs in disease management, specifically focusing on the functions, ingredients, and side effects of commonly prescribed medications. Students gain an understanding of the communication and information technology solutions patients and providers use today. Many of these advances, such as electronic medical records, streamline patient care. This course may interest students specializing in information technology roles for nurse practitioners. Regardless of specialization, all nurse practitioner students complete a course in advanced health assessment. Nurses develop their ability to conduct health assessments for patients of all ages and may learn through clinical experiences, simulations, or human models. American Association of Nurse Practitioners: AANP offers scholarship opportunities for nurse practitioner students and a career center to locate job openings. The association also organizes conferences and events, publishes advanced practice nursing research, and provides continuing education opportunities. National Association of Pediatric Nurse Practitioners: Pediatric nurse practitioners rely on NAPNAP for publications, networking events, and educational resources. The association also hosts a job center and patient education resources. NAPNAP offers a student discount for its membership. American Academy of Emergency Nurse Practitioners: AAENP represents emergency nurse practitioners, and offers member discounts on its certifications. Members also receive professional development resources, access to events, and the academy's Advanced Emergency Nursing Journal. Nurse Practitioners in Women's Health: Women's health nurse practitioners can participate in events and attend courses through NPWH. The organization also offers clinical resources and resources for patients, along with professional guidelines and programs. Members can access continuing education activities and earn continuing education certificates. American Nurses Association: The largest professional association for registered nurses, ANA dates back to 1896. The association also represents APRNs, including nurse practitioners. ANA offers certification in nursing specialties, hosts conferences and events with networking opportunities, and publishes research and professional resources.